You know the saying, "a picture is worth a thousand words"? This is very true when it comes to designing a photography website. The main focus should be the photos, and finding a way to design the site with this in mind is key. 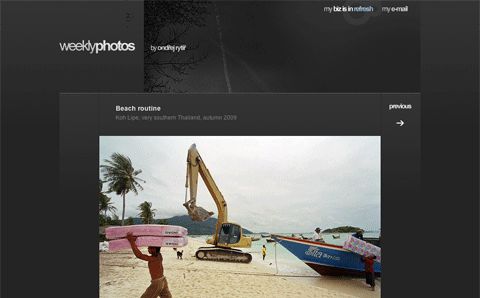 Many photographers' sites are clean and simple, allowing the photos to take up the majority of the content. They also tend to use mostly neutral colors throughout the site as well as a few design elements, so as to not take away from the photos. It's also important to create a navigation that is easy to understand. Many of these sites use Flash to further enhance the experience with animation. With photography being still images, creating some motion can help make the art come alive. However Flash can also be a drawback, as some mobile users can't view it on their cell phones. Another option in this case would be to use jquery, which provides similar results. Jarvis' site has a clean design and uses animation to rotate through the images. Giving the images almost all of the space on the page is great because it makes them the main focus, which is what should draw the viewer in. Another simple, clutter-free design, however the image could take up more real estate on the page. This portfolio has a unique approach, as the photographer showcases different photos each week. This allows multiple images to get a chance in the spotlight, therefore being seen by more people. 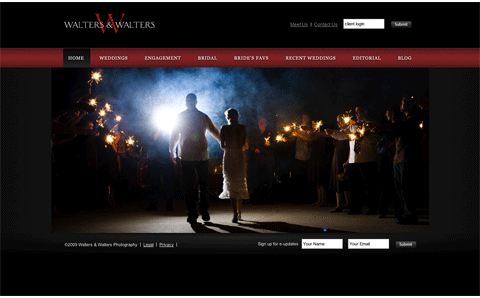 Walters & Walters has an elegant design with a navigation that is easy to understand. Once again, the photo is the main focus of the page, which creates the overall feel for the site. 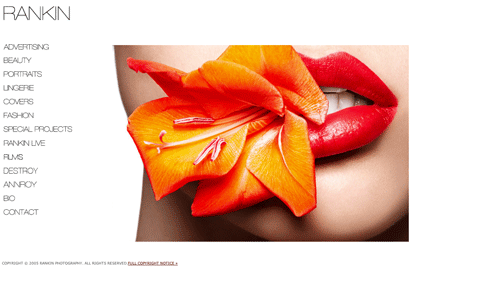 This is a portfolio for a well-known fashion and editorial photographer in the UK. Rankin uses a clean layout with a bold and colorful design. The navigation is on the left, which isn't seen as much anymore, but works well in this case. A nice dark design that works well with the default photograph. It's clear from first glance that this portfolio is all about travel photography. 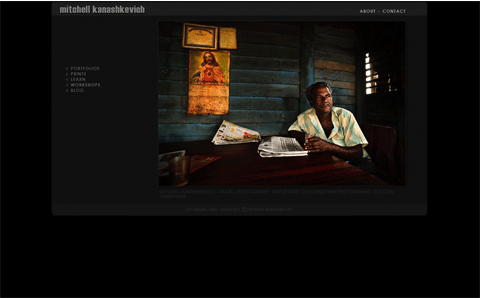 Kanaschkevich doesn't fill his portfolio with a ton of photos, but instead picks the best of the best. This is a good idea with any sort of portfolio, because you don't want to overwhelm the visitor. 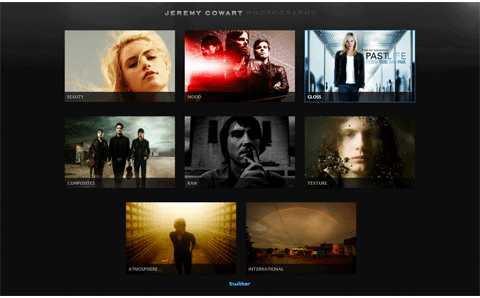 Cowart uses a centered design that shows thumbnails of a variety of different types of photography. This is another good way to show off some of your best work without overwhelming the viewer. By showing multiple images at once, the chances of the visitor seeing an image that catches their eye is greater. 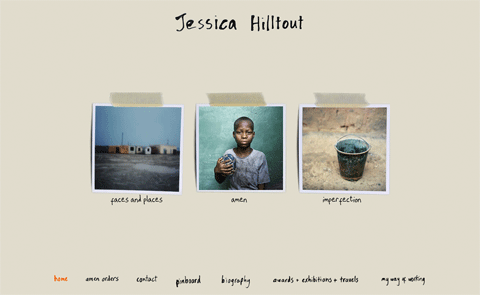 Hilltout's portfolio has a more organic looking design with a unique typography and photos that pop off the page. She chose to create three categories for her photos, which are clearly displayed on the homepage. She also has her navigation on the bottom, like the footer, which is a different approach but works well here. 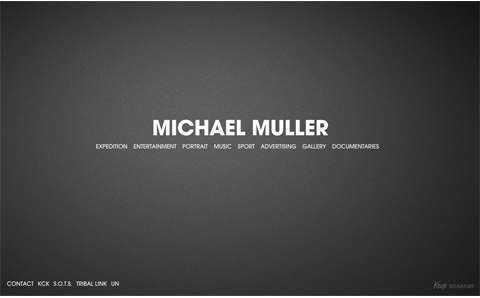 Michael Muller's site has beautiful photos with a nice clean design, but it would be great to see photos right on the homepage. That eye candy will invite the visitor in to look for more. 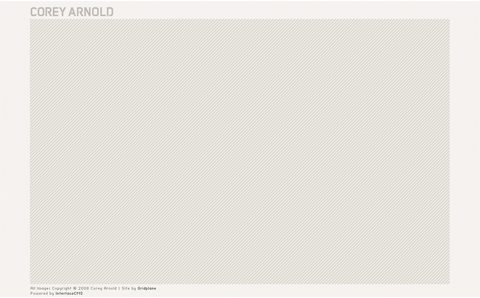 This site took a while for me to load, and didn't even completely load in Safari. In Firefox, I was still left a little confused about what to do, and left unimpressed. Fotomanic has too much text with not enough of the image taking up space. There is also too much dead space on the top. So, what are some easy ways to improve your photography portfolio? Eliminate the side scroll. This should go with out saying, but this is something that is seen way too often, even on the big time photographer's websites. Drop the music - the main focus should be the images. 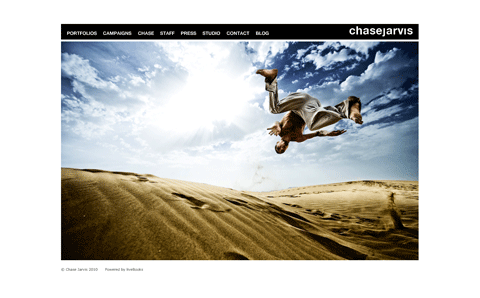 Drop Flash sites, and animation - again, keep the focus on the artwork. Showcase your photos on a background that contrasts the photo - it makes the colors pop. What do you think? Do any of these sites give you inspiration? Do you know of any other good or bad photography sites?